The responders were literally on thin ice in this rescue! A crying labrador retriever’s calls were answered by Hungarian firefighters in a video posted January 2 by the BM National Directorate General for Disaster Management. 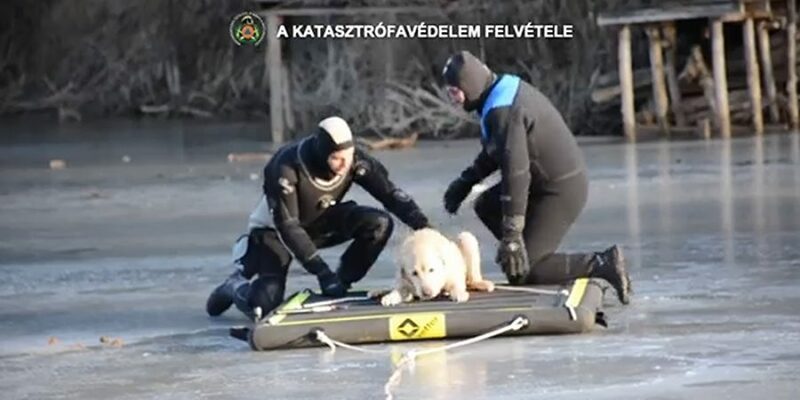 The clip, which has already been viewed nearly 800,000 times, shows the distressed dog stranded in the middle of Lake Csunya before cutting to responding Budapest firefighters. Utilizing an inflatable stretcher, the suited-up firemen are seen carefully hoisting the hound up and out of its icy prison. According to the translated description on Facebook, a veterinarian later checked out the canine and gave it a clean bill of health (aside from understandable hunger).